Safran states it passed a major milestone in its hybrid electric propulsion roadmap with the first ground test of a distributed propulsion system. The test run took place at a Safran Helicopter Engines test facility near Pau-Pyrenees Airport in France. Safran’s hybrid electric propulsion roadmap is focused on bringing these technologies to market by 2025. “Following the recent announcement of our partnership with Bell concerning mobility on demand, this latest milestone clearly reflects Safran’s determination to invest in the development of hybrid electric propulsion systems, which will be the foundation of future propulsion solutions,” said Stéphane Cueille, senior executive vice president for R&T and innovation at Safran. The company explains, that in a distributed hybrid electric propulsion system for aircraft, a turbo-generator – a gas turbine driving an electrical generator – is coupled to a bank of batteries. 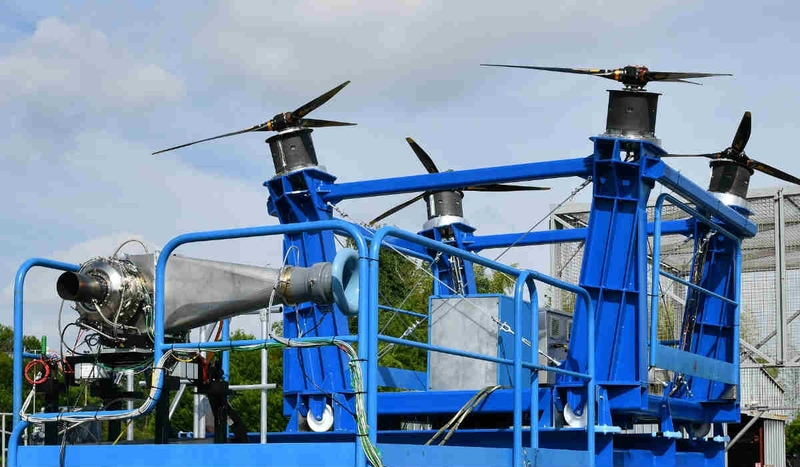 This system then powers multiple electric motors turning propellers to provide propulsion. The power is distributed by a new-generation power management system and the motors are controlled by a smart power electronics assembly. Several operating modes were tested and validated by Safran, with the electric motors powered only by batteries or by a combination of batteries and turbo-generator. The system generated 100 kW of electrical power. The testing was done by Safran Helicopter Engines, Safran Electrical & Power, and Safran Power Units, in conjunction with Safran Tech – the company’s research and technology centre. Hybrid propulsion systems, explains Safran, should contribute to the emergence of new vertical takeoff and landing (VTOL) and short takeoff and landing (STOL) aircraft, by enhancing their flight capabilities and expanding their mission range.